Landscape architects have a strong eye for detail and a highly creative and tech-savvy mindset. They learn to apply principles of both art and science to the design and development of outdoor spaces. From residential gardens to complex urban design, landscape architects use all the skills in their tool belts to create imaginative outdoor environments. This page provides information on how to become a licensed landscape architect and the online degree programs that can help you get there. The path to beginning a career in landscape architecture begins with finding the right degree program. Fortunately, several schools around the country now offer their landscape architecture degrees in entirely online formats, allowing you to approach an academic program without having to worry that your daily routine will be disrupted. The big question remains, though: which school will be best? We’ve put in the time to gather data from each school regarding their success rate, class sizes, and overall cost, and found the top programs available around the country. Look below and check out what we’ve found for 2017 landscape architecture programs. The bureau of labor statistics provides the following data about job growth in the field of Landscape Architecture. As well as the following national median salary data for several different careers in the field of Landscape Architecture. Landscape Architect Specializes in the design of outdoor spaces and structures. $64,570 Bachelor’s degree and state licensure. Architectural Intern Provides assistance to a licensed landscape architect or team of architects to obtain work experience for licensure. $41,167 Bachelor’s degree and state licensure. Landscape Designer Creates renderings and 3D models of landscapes for clients; may be involved with data gathering for site planning purposes and submitting a bid to the client. $42,756 Bachelor’s degree and state licensure. The goal of all online landscape architecture degree programs is to provide students with the necessary skills and hands-on experience to work on complete building projects and use the latest design methodologies and tools to achieve their goals. Most degree programs are divided into lectures and practical application-based courses. Even though the bulk of the program can be completed online, students may need to participate in a design studio component where they are working one-on-one with instructors and students in a classroom setting and learning technical and design skills. Online landscape architecture programs give students a chance to take virtual field trips to explore different types of structures and outdoor spaces from a computer, receive support from online staff members and peers, and participate in discussion groups. Some online degree programs are designed to help students achieve their goals with one-on-one mentoring in a virtual space and encourage collaboration between students with group project assignments. Students may also be required to log in to a course dashboard throughout the week to pick up assignments, participate in discussion groups, and interact with the instructor. At the master’s degree level, landscape architecture students are expected to participate in group projects and apply their knowledge towards design projects. They explore topics such as design media and construction technology and part of the curriculum may involve working in an office setting to gain adequate work experience. In order to obtain their license, landscape architects must complete at least a bachelor’s degree program and obtain three or more years of work experience in the field. Online landscape architecture programs prepare students to take their licensing exam and excel in their field. The flexibility of an online degree program gives students a chance to juggle other responsibilities while working towards their degree, such as family obligations or a part-time or full-time job. Even though most of the coursework can be completed in a student’s home, some of the hands-on training must be completed in person on a college campus or at a designated facility. In-person requirements vary by school and give students a chance to work with the latest tools and technologies used in the field of landscape architecture at modern architectural firms and companies around the country. Aspiring landscape architects have the option to complete a Bachelor of Landscape Architecture (BLA) or Bachelor of Science in Landscape Architecture (BSLA) program online. The BLA is a professional degree program that prepares students for licensure and can be completed in five years. It includes more hands-on training than a BSLA program, which can be completed in four years. Both programs, however, prepares students for state licensure and may include an internship and fieldwork component to help the student obtain valuable hands-on training and develop skills in areas of graphic design, landscape history, and construction landscapes. Those who pursue the five-year BLA degree typically participate in a design studio during their final year where they create landscape projects to present to the instructor and work directly with architects, engineers, and other landscaping professionals to obtain real world experience. The American Society of Landscape Architects identifies three types of graduate degree programs. The first-professional Master of Landscape Architecture (MLA) can be completed in three years and is designed for those who want to become landscape architecture practitioners and hold an undergraduate degree in a field other than landscape architecture. Meanwhile, the second-professional Master of Landscape Architecture (MLA) is a two-year program for those who already completed an undergraduate degree in landscape architecture. Additionally, the Master or Arts (MA) or Master of Science (MS) in Landscape Architecture for those who want to enter the research field but do not want to be registered professional practitioners. At this level, student take advanced courses in areas of landscape architecture theories and history, research methodology, water conservation technology, bioregional planning, and sustainable design. College graduates looking to advance in their careers with comprehensive skills and training can complete a certificate program in landscape architecture instead of pursuing an additional degree. Certificate programs prepare students for entry-level positions in the field and provide the knowledge and skills needed to sit for the LARE. Most require a bachelor’s degree from an accredited institution as a minimum requirement for registration. The curriculum typically includes introductory courses in areas of landscape graphics, history of landscape architecture, and construction technology. It may also include a design studio or practicum studio component where students obtain hands-on training and skills in their field. Students who complete the program earn a certificate, not a degree, in this field. An overview of the field of landscape architecture and how the roles of a landscape architect have changed over time. May include the study of history and social and environmental influences that have shaped this field. Offered at all degree levels, this topic focuses on the historical and contemporary topics in the field of landscape architecture. May help students develop a basis for research projects and learn different theories and practices from leaders in the industry and industry greats. An introduction to drawing and drafting techniques that help students learn basics line drawing skills for site planning purposes. May include an introduction to digital tools and technologies that make the site planning process easier. Covers the process of identifying constraints of a specific site, natural resources and other factors involved in preparing a site for building or construction. Students review different processes and procedures architects use in the site planning process. The design of urban spaces and structures suitable for an urban environment are typically the responsibility of a landscape architect. This course provides graphic skills training and technical knowledge to help the student handle more complex projects in urban and sustainable design. There are many accredited online landscape architecture degree programs but students need to select a program that is aligned with their educational and personal goals. For instance, students who want to explore careers in the research field may want to work toward an MA/MS in Landscape Architecture instead of a traditional Master of Fine Arts in Architecture program. Those who already have a bachelor’s degree in a similar or even unrelated field can pursue a master’s degree program or a certificate program in landscape architecture online to round out their career. Decide which degree type best aligns with your career goals and learning style. Confirm the school is accredited by the Landscape Architectural Accreditation Board (LAAB). Review instructor’s credentials and background in the field of landscape architecture. Compare student pass rates of the LARE from various programs. Determine whether the school offers internship placement assistance, career placement assistance, and mentoring of any kind. 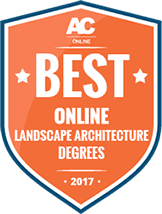 Learn what hardware and software programs are required for online landscape architect degree students. Review tuition costs and options for financial aid for online programs. Aspiring landscape architects need to enroll in an accredited school because completing a program from an accredited school means the student has earned a degree from an institution that upholds high standards of educational excellence. The Landscape Architectural Accreditation Board (LAAB) is responsible for evaluating, advocating for, and advancing the quality of education for all landscape architectural degree programs. It works with representatives from the American Society of Landscape Architects (ASLA), Council of Landscape Architectural Registration Boards (CLARB), and the Council of Educators in Landscape Architecture (CELA). The LAAB accredits educational professional degree programs at the bachelor’s and master’s degree levels. Aspiring landscape architects can be proactive with their career path as early as during their undergraduate studies by attending networking events, workshops, and seminars hosted by area architectural firms and companies. Some schools give students a chance to attend conferences and others special events that can expose the student to industry leaders and professionals who work in the industry. Subscribing to email newsletters or blogs of online architectural firms and professional organizations to stay up-to-date on industry trends. Attending networking events or seminars in the field. Collecting professional references and recommendations during the internship period or when working in any type of position related to this industry. Landscape architects typically work with a team of planners, design professionals, and architects to create 3D renderings and blueprints for their clients. They are responsible for implementing site planning and construction principles into their designs to ensure engineers, developers, and builders are working with realistic guidelines and constraints. Some licensed landscape architects work for a firm while others may choose to work independently to offer planning and design services to private clients. Since licensing requirements can vary from state to state, aspiring landscape architects are advised to first contact their state licensing board where they wish to practice. The American Society of Landscape Architects maintains a complete listing of state boards and contact information. All landscape architects must be licensed before they can practice in their respective state and licensure may not necessarily transfer to another state. The Council of Landscape Architectural Registration Boards (CLARB) writes, administers, and grades the LARE. This exam is divided into four sections and candidates must pass all four areas in order to receive their license. Candidates can complete a self-study program to prepare for the examination and excel in all degree courses to obtain the knowledge they need to sit for the exam. Though not required, certification from the CLARB can give a landscape architect a competitive advantage in the job market since it is an industry-recognized distinction. It enables candidates to apply for reciprocal licensure in Connecticut, Delaware, Mississippi, Nebraska, Ontario, Puerto Rico, South Dakota, and Tennessee. This type of certification also puts the individual on the fast track to licensure because he or she has proved that they meet professional standards used by the CLARB. Ideal for those who want to focus on designing certain types of buildings or applying site planning principles to housing structures, commercial buildings, and other properties. Similar to a landscape architecture degree program except it focuses heavily on the design and construction of residential and commercial properties instead of outdoor spaces. The dynamic field of fashion, merchandising, and retail requires candidates with an eye for design and retail management skills. This degree program encompasses the study of art history, fashion trends, materials and textiles, and fashion marketing. Those interested in the study and research of art history at an advanced level may consider this degree program. These degree programs are less about application and more about the intensive study of different types of art throughout history, the impact of art on modern society, and general design principles.